President of the Republic of Belarus Alexander Lukashenko signing the decision to conduct the state border policy and ensure border security of the country in 2009. On January 15 President of Belarus Alexander Lukashenko approved the resolution, which will guide the state border policy and the border security of the country in 2009, the press service of the head of state told BelTA. Alexander Lukashenko heard out a report made by Chairman of the State Border Committee of Belarus Igor Rachkovsky about the agency’s operation in 2008 and plans for 2009. There are no problems at the Belarusian-Russian border. “In 2008 all issues regarding the ‘green border’ were fixed. There are no problems with border crossing for law-abiding citizens of other countries, who are bound for Russia,” said Igor Rachkovsky. There is an administrative border between Belarus and Russia in line with the friendship and cooperation treaty and all border actions are taken by the Interior Ministry. He remarked the Belarusian and Russian border services have full understanding and operative measures are mainly carried out together with Russian border guards. Efforts are being put into the implementation of the 2007-2011 Union State border accomplishment programme. All in all, over RUB248 million has been utilised to develop and perfect the border infrastructure. The overall border situation remains stable. Igor Rachkovsky said there are no problems with border crossing. Both Belarusian citizens and foreign nationals are pleased with it. The State Border Committee of Belarus has come forward with an initiative to reduce the border zone from 50 km to 10-15 km. The move is supposed to encourage tourism and favourably influence the economy of border regions, noted Igor Rachkovsky. Admittance to the zone will be drastically eased. A Belarusian will need only to pay a state duty, present a passport and get a permit from any border post. A foreign national will have to apply to the State Border Committee of Belarus or a border regiment to get a permit within 5-7 days. The border service has borrowed the practice from Latvia, Lithuania and Poland, which rules are stricter. Igor Rachkovsky remarked, the decision-making of the Belarusian border service had been guided primarily by interests of individuals. The measures will also increase the number of people, who are eager to visit places of interests such as the Augustow Canal and hard-to-reach areas of the Belovezhskaya Pushcha. The official also said, although Latvia and Lithuania acceded to the Schengen zone treaty, the number of foreign citizens willing to visit Belarus did not decrease in 2008. “We welcomed 5.3 million foreign nationals and the same number left Belarus,” he said. The official added, the number of Belarusians, who travelled outside the country, shrank by 1.4%. In 2008 the re-organisation of the Belarusian border service was formalised by basic laws “Belarus State Border” and “Belarus Border Service Units”. The laws laid down the legal basis for the operation of the border service in pursuing the state border policy and ensuring border security. The 2008-2017 Belarus Border Security Concept was adopted along with the state programme aimed at accomplishing the Belarusian-Ukrainian border and modernising the Belarusian-Polish border in 2009-2013. 2008 saw the number of violations of border regulations drop by 10% (from 4,970 in 2007 to 4,470 in 2008) while the number of apprehended trespassers shrank by 23% (from 836 to 644). The number of apprehended illegal transit migrants fell by 45% (from 225 in 2007 to 124 in 2008). The effectiveness of the border service cooperation with the State Customs Committee, the Interior Ministry, the State Security Committee, other state agencies, and local government bodies in matters concerning the border protection has improved. In 2008 over 400 joint actions were carried out, with material assets worth Br10 billion (150% up on 2007) arrested. Together with interested state agencies the State Border Committee of Belarus has taken measures to make border crossing as convenient as possible for individuals and to step up the effectiveness of border protection at border checkpoints. The “one stop for one border checkpoint” principle is in effect in virtually all automobile border checkpoints. It will be used at each and every border checkpoint once the reconstruction of Kamenny Log, Benyakoni, and Kozlovichi border checkpoints is over. The border service and the Interior Ministry have created a system to share information about citizens, whose right to leave Belarus is temporarily restricted. In 2008 the border service detected over 7,000 such persons, including around 50 people on the wanted list. According to Igor Rachkovsky, in 2008 Belarus’ transit attractiveness went up. “Despite the overall falling automobile traffic via the state border, the number of truck trains, which crossed the border, increased by 22%. Thus, the President’s instruction to enhance the transit attractiveness of Belarus has been fulfilled,” underscored Igor Rachkovsky. Air and railroad cargo traffic increased as well. 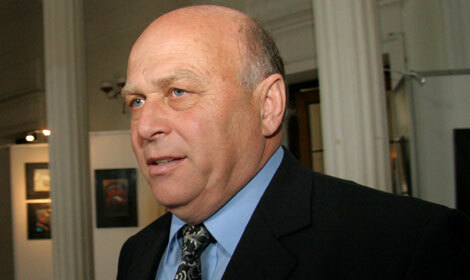 Igor Rachkovsky also said, Belarus and Lithuania plan to sign an agreement on mutual low near-border traffic. The agreement will essentially boost the economy of all near-border regions of Belarus. It will contribute to the expansion of tourism and border services and the development of the so-called public democracy. Using special permits about 800,000 Lithuanians and 600,000 Belarusians will be able to travel into the other country as far as 50 km from the border without visas. People will be able to visit their relatives, orthodox and catholic temples located in Lithuania. “We plan to do the same with regard to Latvia and Poland,” added the official. “I think the European Union will cooperate with our neighbours to allow freedom of travels for people”. The Belarusian border service promotes businesslike and productive relations with counterpart border services of neighbouring countries and international organisations. “We actively cooperation within the framework of various international programmes, including cooperation with the UNDP, the European Commission, the International Organisation for Migration, and others,” said Igor Rachkovsky. In 2008 Belarus was elected to head the working group for counteracting illegal migration of the international border conference, which includes more than 40 border agencies. “It is great trust in Belarus. Our European neighbours evaluate our country as a reliable partner, first of all, in the fight against illegal migration,” believes Igor Rachkovsky. Belarus is determined to dramatically improve its relations with the European Union, said Nina Mazai, Chairperson of the International Affairs and National Security Commission of the Council of the Republic of the National Assembly of Belarus, as she met with the Italian delegation led by Deputy Foreign Minister of Italy, member of the Senate of the parliament Alfredo Mantica, on January 16, BelTA has learnt. Belarus is interested in the participation in the Eastern Partnership project. Nina Mazai expressed hope that the constructive approach demonstrated at the announcement of this project will be preserved during its discussion and finalization. “Belarus appreciates the constructive position of Italy regarding the change of the EU attitude, its participation in the establishment of new relations between Belarus and the EU,” the Belarusian senator said. “We hope it will help restore the full-fledged cooperation between Belarus and the European countries,” she added. Nina Mazai informed her foreign counterparts about the forthcoming visit of Andrea Rigoni, PACE Rapporteur on the Situation in Belarus. “In our opinion, he has established an active, constructive and respectful cooperation with both governmental and non-governmental bodies,” she said. Belarusian parliamentarians appreciate the practical steps undertaken by their Italian counterparts to develop the bilateral cooperation, Nina Mazai concluded. The dialogue between Belarus and the EU is becoming more pragmatic and mutually beneficial, Press Secretary of the Belarusian Foreign Ministry Andrei Popov told a briefing in Minsk on January 15. He noted that the parties had already established closer cooperation contacts in the areas of power engineering, agriculture and other spheres. He assured that the dialogue will develop further. In the nearest future, the Europarliament is to adopt a resolution on Belarus. Andrei Popov abstained from any comments on this document. “Let’s wait for the adoption of this document”, he said. 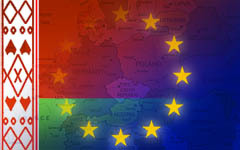 On March 7, 2008, a agreement was signed between the Republic of Belarus and the Commission of European Communities on the establishment, privileges, and immunities of the Representative Office of the Commission of European Communities in the Republic of Belarus which gives opportunities to establish a full-fledged EU diplomatic mission. On January 6, 2009, President of Belarus Alexander Lukashenko ratified this agreement, and on January 1, a set of tax privileges was introduced for the EU office and its members. In December 2008, a framework agreement on financing was signed. It regulates cooperation with the EU on technical assistance issues. A number of technical arrangements concluded at the same time serve as the basis for projects implemented together with the EU in the areas of power engineering, transboundary and nuclear safety. Starting February 1, 2009 full-fledged declarative state registration of businesses will be introduced in Belarus except for banks and non-banking credit and finance institutions. President of Belarus Alexander Lukashenko signed relevant decree No 1 on January 16, the press service of the head of state told BelTA. A business will be entitled to state registration without refusal within one day after submitting a minimal package of documents. A legal person will have to submit an application, the charter and confirmation of the state duty payment. The legal person will get the registration certificate the next business day. A self-employed businessman will have to provide an application, a photo, and confirmation of the state duty payment. Applicants are responsible for legality of the provided documents and correctness of the information they contain. Operation of businesses, which used deliberately false documents during registration, is banned and their registration is deemed invalid. Revenues of such businesses are claimed by the local budget. Persons responsible can be prosecuted and can apply for state registration only one year after the state registration was invalidated. The decree has essentially eased requirements for foundation documents of market participants. The minimal list of documents required for opening a settlement account has been largely curtailed. The decree also simplifies liquidation of businesses, enforces one-stop procedures during business liquidation. The list of reasons for liquidation of legal persons and discontinuation of activities of self-employed businessmen has been reduced as much as possible. An economic entity can be liquidated of its own free will, by an economic court ruling (for violating legislation, as a result of bankruptcy, reduction of net assets below the level of the legal capital) and by the registration body (due to an uncollectible debt, no business operation for 12 months in a row). The press service remarked, the decree represents one more step in economy liberalisation, removal of the bureaucratic barriers, which hinders business start-up, and indicates the government’s trust in businesses and the readiness of government agencies to build partnership relations with legal persons and self-employed businessmen. The first tranche of the loan of the International Monetary Fund (IMF) at the amount of $787.9 million has been transferred to Belarus, BelTA learnt from the information department of the National Bank of Belarus. A reminder, on January 12, 2009, the Executive Board of the International Monetary Fund approved a 15-month Stand-By Arrangement for $2.46 billion for Belarus. Belarus applied to this international finance organization for a loan in order to increase the national gold and foreign exchange reserves and to create a kind of “safety cushion” essential for the sustained economic development in the conditions of the global financial crisis. This money will be added to the national gold and foreign exchange reserves to maintain the national currency rate. Belarus joined the IMF on July 10, 1992; its quota is SDR 386.4 million (about $588.0 million). Its latest arrangement with the IMF was a Stand-By Arrangement that expired on September 11, 1996. Belarus will continue pursuing the policy aimed at building an innovation economy. The point was highlighted as Prime Minister Sergei Sidorsky delivered a report to President of Belarus Alexander Lukashenko on January 15, the press service of the President of Belarus told BelTA. The Belarusian head of state was informed about results of the social and economic development of Belarus in 2008. Last year most goals approved by the President were reached. The Gross Domestic Product went up by 10%, which is a good result in view of the global financial crisis. In particular, the year was successful for agribusiness, with its output 8.9% up. The industrial output increased by 10.8%. Labour productivity at industrial enterprises grew by over 9% while the annual target was set at 6.9-7.9%. The profitability of sold products in the industry amounted to 16.3%, with the forecast as high as 12-13%. 2008 saw 5.1 million square metres of new homes commissioned, with the forecast set at 4.7 million square metres. Over 70% of the homes were meant for people in need of better housing. However, in 2008 the inflation exceeded the forecast and reached 13.3% or 1.1% monthly on the average. The growth was mainly attributed to growing prices for energy, raw materials and other commodities. The Prime Minister said, “We entered 2009 with a specific programme of anticrisis measures to guide the economy operation in view of the global economic crisis”. According to Sergei Sidorsky, the IMF praised the stabilisation programme presented by the Belarusian government. IMF experts said it is quite a balanced plan of actions. The head of government assured it will be implemented both in the real economy sector and certain social branches. In 2008 all social programmes were accomplished and pensions were raised several times during the year. The President demanded that the economy operation should be as steady in 2009 and pointed out that all ongoing social programmes should be implemented. Alexander Lukashenko underscored, Belarus will continue building an innovation economy. Last year fixed-capital investments grew by 23.1%. Foreign direct investments exceeded $2 billion, with over $5 billion expected in 2009. All in all, investments into the Belarusian economy exceeded Br30 trillion. In 2009 investments are supposed to be as large. In 2009 the government and local government agencies will focus on fulfilling programmes for housing construction, development of rural, small and medium urban communities. Sergei Sidorsky promised that the government would take all necessary measures to preserve jobs in view of the global financial crisis. The President has stressed it is important to implement the goals on the development of the economic real sector and the socio-economic plans in 2009. The products should be sold, not to be stored. The two sides discussed the issues concerning a forthcoming session of the Union State Council of Ministers which is due in Moscow on January 30. At present the draft agenda contains nearly 35 items. The President was reported on that in view of the global financial crisis the Belarusian government intends to focus on the elaboration of particular measures to protect the interest of the national producers on the Belarusian and Russian markets. The Economy Ministries of the two countries are currently engaged in the coordination of the joint plan of actions to minimize the possible outcomes of the global financial crisis, improve the parameters of the balance of payment and perfect the conditions for doing business and mutual trade. The Union State Council of Ministers’ session will also focus on the preparations for a session of the Supreme State Council that is due in February. The President of Belarus commissioned to consider the whole range of issues included into the agenda of the session. The two sides discussed the issues related to the development of several areas of the economy. The Head of State gave concrete commissions on the development of BMZ, the Shklov Newsprint Mill. The President will take the activity of all GDP-forming companies under his personal control. Sergei Sidorsky reported on the measures taken to liberalize the economy and improve the economic conditions. The liberalization of economy is the major goal the President set forth before the government last year. The country has taken specific measures to improve the conditions for doing business in pursuance of the President’s commissions to liberalize the economy and in line with the government-approved plans of the most important events on liberalization of the economic activity in 2008. The meeting also touched upon the issues related to the price situation on the Belarusian consumer market. The government decided not to regulate the prices this year except the prices for the socially important goods. However, the beginning of the year has already seen enough problems related to pricing. In early 2009 the exchange rate of the Belarusian ruble against the US dollar devalued 20.5%. The decision, according to the government’s expectations, should not have driven up the prices for the imported goods as the foreign markets have seen a slash in prices in view of the global financial crisis. The monitoring of the price situation on the country’s consumer market has registered a considerable and groundless increase in retail prices starting from January 2, 2009. While breaching the law some sole traders offered overpriced domestic goods. The country faced the situation of groundlessly growing prices on the back of the decreasing prices worldwide. The government decided to give some spot check-ups. Violators will face punishment up to revocation of the licence. Prices should be reduced. An increase should make up not more than 5-7%, Sergei Sidorsky said. The President ordered the government to take the price situation on Belarus’ consumer market under permanent control. Gazprom and Belarus have come to an "understanding" on the price the Russian company will charge Belarus for its gas in 2009, Gazprom's spokesman said on Saturday. "We have understanding about the pricing terms we will get through this year with. I think it will be possible to disclose this very soon," Sergei Kupriyanov told reporters on the fringes of a current international gas summit in Moscow. "We do have a preliminary agreement on the terms for a contract given the fact that we do have a contract that is in effect, a medium-term contract," Kupriyanov said. "There has been no urgent need to sign all the papers at the end of last year." "We are very grateful to our Belarusian counterparts that, in this pretty difficult situation, they have been able to seriously build up volumes of gas transmission through Belarus, both through the Yamal-Europe pipeline and through the networks of Beltransgaz," Kupriyanov said in reference to impeded supplies of Russian gas to Europe as a result of the Russian-Ukrainian gas row. "This has considerable helped us in this crisis situation," he said. Belarus proposes laying a new pipeline to guarantee stable supplies of Russian gas to Europe and offers to seek the consent of Poland and Germany to such a project, a source in the Belarusian delegation to the current gas summit in Moscow said on Saturday. "Belarus believes that it would be an economically efficient project today to build a Yamal-Europe-2 gas pipeline. The situation that has taken shape today shows that additional reliable facilities for the transit of Russian gas to Europe are needed as soon as possible," the source told Interfax. The proposed pipeline would carry gas from the Yamal Peninsula in northwestern Siberia. It would be a second strand of the current Yamal-Europe pipeline. "The Nord Stream and South Stream [pipeline] projects that Russia is considering cannot be put into reality before 2010 [while] Yamal- Europe 2 might be put into operation within a period of a year and a half to two years with much lower financial inputs," the source said. "Belarus is willing to take on a commitment to seek the consent of Poland and Germany to the construction of Yamal-Europe-2," he said. On January 15, the governments of Belarus and Ukraine signed the treaty concerning the framing of the system of measures for intensification of bilateral trade and economic cooperation in the terms of the global financial and economic crisis. Vladimir Semashko, the First Deputy Prime Minister of Belarus, and Alexander Turchinov, the First Vice Prime Minister of Ukraine, appended own signatures on the document after the finishing of the working meeting in Gomel. The treaty will provide assistance to the countries in various directions, including the commission to bank structures to work out the refusal from anchoring to USD in financial operations. According to A.Turchinov, if the treaty successes, other countries will join the cooperation. Belarus' industrial output has been dropping since September 2008 because of the global financial crisis, Uladzimir Zinowski, chairman of the National Statistics Committee, told reporters in Minsk on Friday. "The fall was caused by dwindling demand for Belarusian companies' goods, which, for its turn, was a result of the weakening paying capacity of consumers in the world," the official said. "The export-oriented Belarusian industry could not but feel the impact of the crisis and its effects on neighboring countries." The country's industrial output decreased by 22 percent in December compared with August and by 7.2 percent compared with November. In December, it decreased by 17 percent in the building materials industry, by 10 percent in the light industry and by eight percent in machine building and metalworking, with the production of metal-cutting machines going down by 34 percent, buses and tractors by 20 percent, TV sets and electric stoves by 18 percent and trucks by 15 percent. A number of Belarusian exports also went down in the first 11 months of 2008 compared with the first 10 months of 2007. Exports of metal-cutting machines decreased by 80 percent, trucks by 70 percent, combustion engines by 67 percent, and steel tubes, tractors, tires and potash fertilizers by more than 50 percent. The decrease in the export caused an increase in stocks of finished products, Mr. Zinowski said. Stocks of ferrous metals rose 7.5-fold, trucks twofold, artificial fiber 1.7-fold and tires 1.6-fold. The stocks accounted for 61.1 percent of the average monthly output. 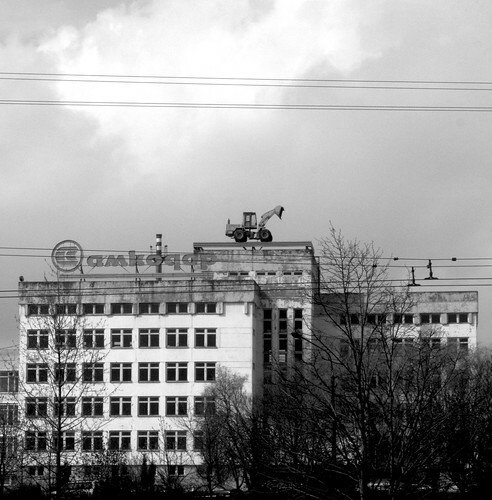 They were particularly big in the light, machine building and metalworking, food and woodworking industries. At the same time, the country's industrial output increased by 10.8 percent in 2008 compared with the previous year, with the oil-refining, machine building, metalworking and building materials industries posting their output growth at more than 10 percent, according to Mr. Zinowski. In a related story, Belarus' consumer prices are projected to increase by a total of three percent in January, Uladzimir Zinowski, chairman of the National Statistics Committee, told reporters in Minsk on Friday. Mr. Zinowski said that the figure was "quite high," given that the inflation rate had gone up by 13.3 percent throughout the previous year. According to him, the country's consumer prices jumped by more than two percent on average in the first week of the year. Mr. Zinowski put the price hikes to the increased prices of vegetables and utility services, adding that the devaluation of the Belarusian rubel "also" had been a factor. The state-owned Belarusian Publishing House has cancelled its contract with the Borisovskiye novosti newspaper, says editor-in-chief Anatol Bukas. The decision was attributed to ‘certain violations of printing schedule’. 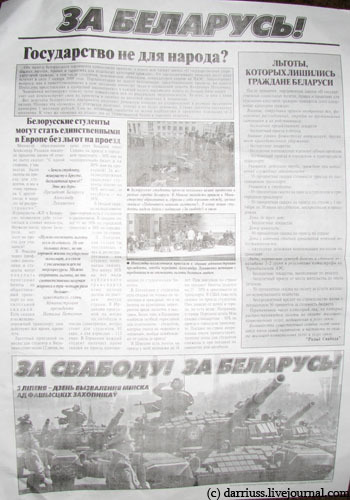 The newspaper has not been able to be published in its hometown of Barysau since 1996. The Brest-based independent newspaper Intex-press has received another refusal to be distributed in the state-owned Brestoblsoyuzpechat network. In his letter of 12 January, vice-head of Brestoblsoyuzpechat T.Zinevich said the contract would not continue contract with the newspaper due to ‘network overload and under Article 391 of the Civil Code of Belarus’. Thus, under current circumstances of ‘relative liberalization’ in Belarus the independent newspaper was given to understand it is not welcome in Brest. Mahiliou Leninski borough court is due to try the case of ex-parliamentary candidate Ihar Kavalenka vs. Mahiliou town authorities. The plaintiff is trying to register an action group to hold a local referendum. Kavalenka claims he is representative of the group. On 30 December judge Tarasava obliged Kavalenka to secure appearance of all the members of the group. The referendum is aimed at challenging the authorities’ decision to build a sports center instead of the Krynitsa market. The authorities’ negative decision was attributed to the ‘public interest’. On 6 January the market began to be disassembled, all the vendors having been forced to leave. The Ministry of Internal Affaires of Belarus has filed an application demanding to amend the law on dactylography. The Ministry of Internal Affaires of Belarus filed application to the Security Council and the Council of Ministers for amending article 1 of the law on state dactylography, minister of internal affaires Uladzimir Navumau told at apres conference in Minsk on Thursday, Interfax reports. “We will offer to amend the law, allowing to fingerprint not only draftees, but also persons subject to recall,” U. Navumau told. According to the head of the interior ministry, these changes are needed to promote detection of Minsk blast. “In any country, law enforcement bodies don’t report about investigation, because it hinders their work,” the minister noted speaking about investigation of Minsk blast on July 4, 2008. According to Navumau, “the investigation will undoubtedly be successful”. It should be reminded that tens if not hundreds of thousands of people –workers, clerks, students, and even schoolchildren, winners of chemistry contests, were fingerprinted after the blast in Minsk. In the confrontation between Russia and Ukraine over natural gas shipments to Europe, the grand prize may yet be control of Ukraine's sprawling pipeline network, Moscow's main conduit for pumping the fuel to its most lucrative markets. Although the dispute appeared close to an end after Sunday's announcement of a deal, the terms of the accord could increase pressure on Ukraine to cede control of the labyrinthine network. The agreement outlined by Russian Prime Minister Vladimir Putin appears to call for Ukraine to pay roughly twice as much for natural gas as it did in 2008, a potentially severe blow to an economy already reeling amid the global economic troubles. Russia stopped shipping gas to Ukraine for domestic use on Jan. 1 over a price dispute and Kremlin accusations that Ukraine was siphoning off Europe-bound gas. It turned off the taps completely on Jan. 7 — leaving much of Europe without power. The standoff has led to at least a dozen confirmed deaths, hundreds of factory shutdowns that could cost billions in lost productivity — and snapped heating to millions of people in the depths of winter. Ukraine boasts one of the largest gas networks in the world. Some 37,800 kilometers (23,500 miles) long, the network earns Ukraine $3 billion in annual revenue from transit fees from Russian gas giant Gazprom and has capacity to export some 175 billion cubic meters annually. It is a prize that Moscow has eyed since the 1991 Soviet collapse. Under former Ukrainian President Leonid Kuchma, Russia came close to brokering a deal with Ukraine and Germany to lease the country's pipeline system, but the deal proved politically contentious and was later abandoned. Some analysts also say the 2006 gas crisis, when Russia shut off gas Ukraine for several days, leading to supply disruptions in Europe, was chiefly about control of the pipelines. Since then, Ukraine has tried to shield its pipelines from Russia's grasp, including passing laws to block its sale and efforts prevent the bankruptcy of debt-riddled Naftogaz Ukrainy, which owns the system. Ukrainian Prime Minister Yulia Tymoshenko said this month the pipeline network is not for sale. The government has also made clear that leasing the system is out of the question because that would put the pipelines effectively under Russian control. Nevertheless, Russia continues to covet this major energy corridor. In an interview earlier this month on Germany's ARD television, Putin said Russian companies would consider leasing Ukraine's pipeline system along with European partners. "We may take part in privatization if Ukraine wants it," said Putin. But, he added, Ukraine considers the pipelines "its national treasure, almost God-given, and not subject to privatization." Russia, which boasts the world's largest natural gas reserves, depends on gas revenues from Europe, where it charges far more than it does domestic customers. Approximately four-fifths of its exports flow through Ukraine's pipelines. A smaller amount is piped through Belarus and the Blue Stream pipeline to Turkey. The planned Nord Stream pipeline, connecting Germany and Russia through the Baltic Sea, would help break Ukraine's grip on gas shipments. Critics fear the project would give Russia too much political power over its neighbors — and some experts see Russia using the current dispute to pressure Europe into endorsing Nord Stream. Russia has acquired vital pipelines elsewhere in former Soviet space. It owns 50 percent of Belarus's pipeline network, another fractious neighbor that has resisted higher gas prices. Ukraine remains vulnerable to a drawn-out conflict. Its banking system has been humbled, its national currency has collapsed, and the International Monetary Fund extended the country a $16.5 billion emergency bailout late last year. In a move that could put further pressure on Ukraine's troubled economy, Russia decided to hike steel import tariffs earlier this week. Ukraine is a major steel exporter to Russia. "I think there is a real attempt to undermine Ukraine both politically and economically," said Julian Lee, an analyst at the London-based Center for Global Energy Studies. "They will continue to squeeze Ukraine economically." A worker in Kiev views an indicator board at the main gas distribution center of Naftogaz, the state energy company. In the heady months following the Orange Revolution, after the crowds had swept the democratic opposition into power but before the hopes inspired by the movement had begun to fade, Ukraine's new, American-backed leaders decided to renegotiate the terms on which the country purchased natural gas from Russia. President Viktor Yushchenko, the former banker who defeated the Kremlin's favored candidate, had campaigned on a promise to fight corruption, using the rallying cry, "Put the bandits in jail!" The gas contract with Russia, a notorious source of patronage and cash for the old regime, was a natural target for his new government. But now, as Ukraine prepares to sign an accord ending an 18-day Russian gas embargo that disrupted energy supplies in much of Europe, the consensus here is that instead of cleaning up the gas trade, Yushchenko's first gas deal left this former Soviet republic more vulnerable to bullying by Russian leaders determined to thwart its turn to the West. Concessions made three years ago -- under suspicious circumstances, some say -- sharply reduced Ukraine's leverage against Russia in this month's crisis. More broadly, according to a wide spectrum of political figures, journalists, diplomats and analysts, the Orange Revolution's failure to eliminate the corrupting influence of cheap Russian gas poisoned Ukraine's transition to democratic politics, tarnishing its reputation abroad and leaving much of the public here disillusioned. "There are no reformers left," said Alexander Dubinsky, a business journalist for the Ekonomicheskie Izvestia newspaper. "After a reformer gains power, he becomes corrupt, too. That's what people think now." In explaining the importance of access to Russian gas in Ukrainian politics, he added: "All the big money here was made in gas. If you control the gas, you can control industries, you can control politicians." Early Sunday, Russian Prime Minister Vladimir Putin and his Ukrainian counterpart, Yulia Tymoshenko, emerged from late-night talks in Moscow with the outline of a deal to end the midwinter standoff over gas prices that has left large parts of Europe struggling to maintain heat and electricity for 12 days. Russia said it would grant a 20 percent discount to Ukraine on European gas prices this year, while Ukraine agreed not to raise the low fee it charges Russia to use its pipelines to deliver gas to Europe. Tymoshenko was scheduled to return to Moscow on Monday to sign the contract, but the details, which have derailed previous deals, were still being worked out. Depending on the fine print, the agreement will probably mean a gas price not far from the final negotiating positions of both sides before talks broke down, suggesting that the standoff has always been less about commercial differences than political ones. Many in Ukraine and the West have seen it as an attempt by Russia to assert its influence in the region and weaken the pro-Western government of a neighbor, a sort of non-violent sequel to its August war against Georgia. But the crisis also highlighted much of what has gone wrong with Ukraine's experiment in democracy, including a crippling feud between the Orange Revolution's leaders, Yushchenko and Tymoshenko, and a weak judiciary that has been unable to address pervasive allegations of corruption. The political disarray has played into the Kremlin's efforts to portray Ukraine to the world as a failed state, unfit for membership in NATO and the European Union, and to convince the Russian people of the superiority of Putin's more authoritarian model of government. "They simply didn't know what to do, and therefore made many mistakes," said Viktor Yanukovich, the pro-Kremlin politician who was defeated in the Orange Revolution and who now leads the largest party in parliament. Russia has sold natural gas to Ukraine at below-market prices since the fall of the Soviet Union, a legacy of the communist planned economy. But many scholars say cheap gas has hurt Ukraine more than it has helped, creating opportunities for corruption because billions can be made by those with access to the fuel. The Orange Revolution raised hopes for reform, with the government launching an investigation into the gas sector. But in September 2005, Yushchenko dismissed Tymoshenko as prime minister, and in January 2006, after a brief standoff, Ukraine and Russia struck a new gas deal. Yushchenko hailed the contract as a victory because it allowed Ukraine to continue receiving gas at subsidized prices for another year. In exchange, Ukraine agreed to charge Russia a low fee to use its pipelines. It soon became public, however, that the contract allowed Russia to increase gas prices every year but fixed Ukraine's transit fee for five years, a condition that severely weakened its negotiating position this month. In addition, the deal gave a shadowy intermediary company, RosUkrEnergo, full control of gas imports from Russia, as well as access to the Ukrainian domestic market. Gazprom, the Russian gas monopoly, owns half the firm, and two Ukrainian tycoons say they own the other half. Tymoshenko says the company is a vehicle for corruption benefiting both Russian and Ukrainian officials. "It was a huge opportunity lost," said Edward Chow, a senior fellow at the Center for Strategic and International Studies in Washington, who argues that Ukraine's failure to reform its gas sector continues to "destroy public trust in its politics, and undermine the interests of its European neighbors." The gas deal came under attack in the newly assertive Ukrainian press. Yushchenko stood by it while his allies accused its most prominent critic, Tymoshenko, of being upset because her own attempts to profit on the deal had been thwarted. No investigation ever sorted through the competing accusations. Igor Burakovsky, director of the Institute for Economic Research and Policy Consulting in Kiev, said the situation is typical of Ukraine's incomplete democratic transition. There is free speech and wide access to information, he said, but fervent debate rarely leads to action because of the weakness of the courts and other institutions. "It creates a cloud of cynicism," he said. "People believe everyone is a thief, but nobody is ever punished." U.S. officials have urged Ukrainian leaders to reform the gas sector by boosting domestic production, improving energy efficiency and eliminating RosUkrEnergo. But analysts say corruption has worsened because political uncertainty has encouraged short-term thinking. Yushchenko has appointed four prime ministers in as many years. In 2007, the state energy firm, Naftogaz, tried to determine what it should be charging Russia to use its pipelines. Yuri Vitrenko, the economist who supervised the analysis, concluded Ukraine was getting paid much less than it cost to operate the pipelines and recommended a sharp increase. But the government responded by asking him to justify the lower fee. "They just wanted to keep the old deal," he said. Yushchenko's failure to bring corruption under control has contributed to a precipitous drop in his approval ratings, from highs near 75 percent after the Orange Revolution to less than 5 percent now. Bohdan Sokolovsky, Yushchenko's representative on energy security, said the president was not directly involved in the 2006 gas deal and argued it may have been the best contract possible at the time. But he acknowledged that the government needed to do more to reform the gas sector. "We remain critical ourselves about the too-slow pace," he said, especially "because there were higher expectations" after the Orange Revolution. He added that the government was continuing to work on the problem "step by step." "The less politics in the energy sector, the more just and open it will be," he said. "This is the position of President Yushchenko." Tymoshenko, who was appointed prime minister again in late 2007 and is expected to challenge Yushchenko for the presidency this year, told reporters last week that Ukrainian politicians derailed a December deal because she had insisted on cutting out RosUkrEnergo. She did not accuse Yushchenko directly, but only the president would have the power to overrule her. An official in the president's office fired back Friday, accusing Tymoshenko of being "hooked by Russian special services" and recalling that she made a fortune in the 1990s as chief of a gas trading firm that was investigated for criminal activity. "We think it was a crime," Hryhoriy Nemyria, one of her deputy prime ministers, said of the 2006 gas contract. "It basically created a situation of strategic vulnerability for Ukraine." Russia’s central bank devalued the ruble for the fifth time in six trading days, allowing it to fall against the dollar and the euro, an official said. The currency’s trading band against Bank Rossii’s target dollar-euro basket was widened, the bank official, who declined to be identified on bank policy, said in an interview from Moscow. The ruble was devalued every trading day this week except for Jan. 13. Russia’s ruble weakened 1.1 percent to 37.3054 against the basket by 10:08 a.m. in Moscow, from 36.9090 yesterday. The basket is made up of about 55 percent dollars and the rest euros and is used by policy makers to limit fluctuations that hurt the competitiveness of exporters. The bank official wouldn’t confirm the ruble’s new trading range or comment on how long the devaluations may continue. The Belarusian Olympic mission at the winter Olympic Games 2010 in Vancouver, Canada, will be headed by Deputy Minister for Sports and Tourism Dmitry Shichko. The decision was taken at a session of the Executive Committee of the National Olympic Committee (NOC) of Belarus on January 15, BelTA learnt from NOC press attach? Piotr Ryabukhin. NOC Secretary General Georgy Katulin stressed that this candidature had been coordinated with President of the National Olympic Committee Alexander Lukashenko. The NOC Executive Committee also summarized the results of the national contest “10 best athletes and the best team of the Republic of Belarus in 2008”. The list of the best athletes included Andrei Aryamnov (weightlifting), Oksana Menkova (athletics), Andrei Bogdanovich and Alexander Bogdanovich (C2 rowing), Andrei Kravchenko (athletics), Andrei Rybakov (weightlifting), Inna Zhukova (rhythmic gymnastics), Natalya Mikhnevich (athletics), Roman Petrushenko, Vadim Makhnev (K2 rowing), Yekaterina Karsten (rowing), Vasily Kirienko (cycle racing). Andrei Aryamnov and Oksana Menkova have been named the best athletes 2008. BATE has become the best men's team and the national basketball team has been recognized as the best women's team. Daria Domracheva from Belarus was third in the women’s 7.5km sprint at Biathlon World Cup in Ruhpolding (Germany), BelTA has learnt. The Belarusian athlete completed 7.5 km race in 23:40.6 minutes. Magdalena Neuner from Germany won the gold medal and her compatriot Kati Wilhelm was second. It is the first world cup medal Daria Domracheva has won in individual disciplines. The top 40 biathletes include Olga Kudryashova (placed 22nd), Olga Nazarova (placed 24th) and Liudmila Kalinchik (placed 39th). Nadezhda Skardino (placed 54th) will also be able to take part in the women’s pursuit that will be held on January 18. The first stage of the Belarus Shooting Cup started in Brest on January 14, a representative of the Physical Training, Sport and Tourism Office of the Brest Oblast Executive Committee told BelTA. More than 130 sportsmen participate in competitions. They are the best Belarusian shooters who participated in the Olympic Games in Beijing. The competition events include small-bore and pneumatic rifle and pistol. The competition features ten exercises taken from the Olympic Games. On January 14 women are supposed to participate in the pneumatic rifle and pistol events while men are expected to compete in the small-bore pistol event. The first stage is supposed to finish on January 17. The Belarus Shooting Cup consists of four stages. The next one will take place in March. After considering the results of this very tournament a new national team will be made. In the future it will take part in the European championship in Prague (the Czech Republic) on February 16-23.
другую частку (студзеньскую) прэзентацыі кнігі “ЖываЯ”, на якой аўтарка кнігі АКСАНА СПРЫНЧАН – старэйшая за ўсіх выступоўцаў. Згодна 11 раздзелаў кнігі адбудуцца наступныя жыватворчыя выступы: Тацяна СІВЕЦ (ЖываЯ…), Рагнед МАЛАХОЎСКІ (ЖываЯ,), Віка ТРЭНАС (ЖываЯ. ), Зміцер АРЦЮХ (ЖываЯ), Валерына КУСТАВА (“ЖываЯ”), Маргарыта ПРОХАР (ЖываЯ:), гурт “ПЕРАПЛУТ” (ЖываЯ? ), Аляксей ЧУБАТ (ЖываЯ – ), Таццяна БУДОВІЧ (ЖываЯ;), Вольга СПРЫНЧАН ((ЖываЯ)), Вадзім КЛІМОВІЧ (ЖываЯ!). Жывыя партрэты выступоўцаў ствараюць мастакі Альгерд ФРАНЦУЗАЎ і Ян МЯЛЬНІЦКІ. у музеі Максіма Багдановіча (вуліца Багдановіча, 7а). УВАХОД, ЯК І ВЫСТУПЫ, ВОЛЬНЫ. A new study has found a link between the economic "shock therapy" of mass privatization in postcommunist countries in the early 1990s and a surge in the death rate for working-age men. Published by the prestigious British medical journal "The Lancet," the Oxford University-led study contributes to a growing body of research about the human cost of the rapid economic transition from communism to capitalism. Researchers measured the relationship between death rates and the speed and scale of privatization in 25 countries of Eastern Europe and the former Soviet Union dating back to the early 1990s. The researchers examined other factors also associated with hardships during the early 1990s -- including the collapse of the Soviet-era economic infrastructure, hyperinflation, and military conflicts. They found that former communist countries that implemented the "shock therapy" of rapid mass-privatization schemes during the early 1990s saw an average surge of 13 percent in the number of deaths. "During the transition to capitalism, one of the world's worst peacetime mortality crises occurred. The United Nations estimated that in the early 1990s, there were 3 million avoidable deaths that occurred over and above historical trends," says David Stuckler, a sociologist and public-health expert at Oxford University who led the research team. "This has been a puzzle to the field of public health. No one expected so many working-aged men, in particular, to die in connection with the transition to capitalism," he continues. "What our study shows is that these deaths were not simply inevitable, but that they were connected with a specific strategy -- in particular, the 'big bang' rapid approach to building capitalism out of communism." Along with other recent research, Stuckler says the study helps explain some of the widespread suffering associated with economic transition after the collapse of communism. Still, he says that it would be wrong to say that the research proves mass privatization was a direct cause for the rise of the mortality rate. "As with any statistical study, it is nearly impossible to make the leap from association to causation. But what a good scientist will do is test as many implications of the theory or hypothesis as possible," Stuckler says. "As a social scientist, I think of it as building a case for causality," he continues. "We were very careful in the paper to say that mass privatization was 'strongly linked' and 'associated' with these rises [rather than a direct cause]. We were able to isolate mass privatization from the other major policies on the table at this time -- which were [price] liberalization and [economic] stabilization. So we were able to hold constant those factors in the statistical analysis." Co-author Martin McKee, a physician at the London School of Hygiene and Tropical Medicine, says previous studies have shown alcohol poisoning is one immediate explanation for the surge in deaths. Other contributing factors include poor diets and the collapse of the health-care infrastructure formerly provided at state-owned factories under communism. Ultimately, the researchers say, rapid privatization schemes led to stressful unemployment that contributed to alcohol abuse and poor health during the early 1990s. "Our study takes the next step and shows which specific transition policies could help explain why alcoholism and unemployment rose so much more greatly in Russia, for example, compared with a neighboring country like Belarus," Stuckler says. "Both countries had to make a similar leap over to capitalism. Except Russia implemented a rapid approach whereas Belarus was much more gradual -- even criticized at one point by the radical, rapid reformers as being a Soviet theme park for moving so slowly." Stuckler notes that wars or civil conflicts occurred in several regions during the period studied. He says that is why the statistical models specifically included and directly measured the potential effect of war on working-age male mortality rates. "In Tajikistan, there was a devastating civil conflict during this period that led to a loss of about 11 years of male life expectancy," he says. "So we had to be careful in our analysis that our results weren't being driven by war, but that they were specifically linked to the policies we were studying. [Ironically,] Croatia, despite undergoing conflict during this period, was one of the best performers in terms of mortality." But Stuckler also says the researchers tried to ensure that the impact of war did not skew their data and lead to erroneous conclusions about links between government economic policies and rising mortality rates. "There are some considerations that war damages public-health infrastructure -- which can lead to an underreporting of death. For example, in the Chechnya region, there are missing death certificates. That could be problematic and could have biased mortality numbers downward," Stuckler says. "Also, in Georgia, there have been problems with registration of death in connection with privatization, on one hand, where people suddenly were charged [money] for registering deaths, and also, some of the ethnic conflicts that were occurring." As a result of those controls, Stuckler says he is confident about the strong statistical significance of links found between plummeting life expectancy and economic policies in countries that had implemented rapid mass privatization -- like Russia, Kazakhstan, Latvia, Lithuania, and Estonia. All of those countries implemented extremely rapid privatization programs during the early 1990s. At the same time, they suffered a tripling of unemployment, up to more than 30 percent, and a 42 percent increase in the mortality rate for working-age men between 1991 and 1994. Meanwhile, other postcommunist countries that implemented a much slower pace of reform -- gradually phasing in free-market conditions and developing appropriate institutions -- had fared much better. According to the study, the best five performing countries were Albania, Croatia, the Czech Republic, Poland, and Slovenia. Each of those countries actually experienced a 10 percent decline in male mortality and only a 2 percent increase in unemployment. Another factor that contributed to a lowering of the mortality rate was the level of social support available to the population. If at least 45 percent of a country's population were members of at least one social organization -- such as a church or a trade union -- they were better protected from economic shocks. Report co-author Lawrence King says the findings are important for countries that are now moving ahead with their own privatization programs, like China, India, and Iraq. King concludes that reformers should be extremely cautious in the future about radically overhauling a society's economy. At the very least, he says, policymakers should assess the potential impact upon public health before trying to radically overhaul a country's economy -- particularly when they promise long-term gains at the cost of short-term harm.